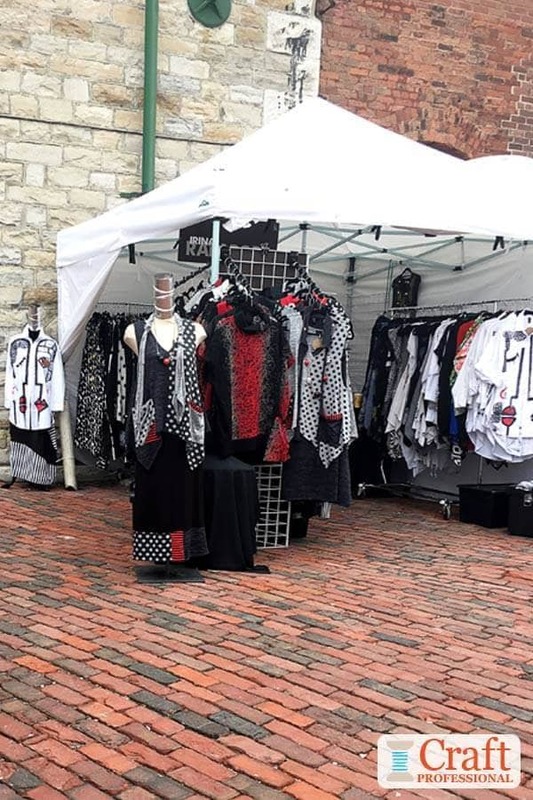 I have some brand new clothing display pictures from an excellent outdoor craft show. 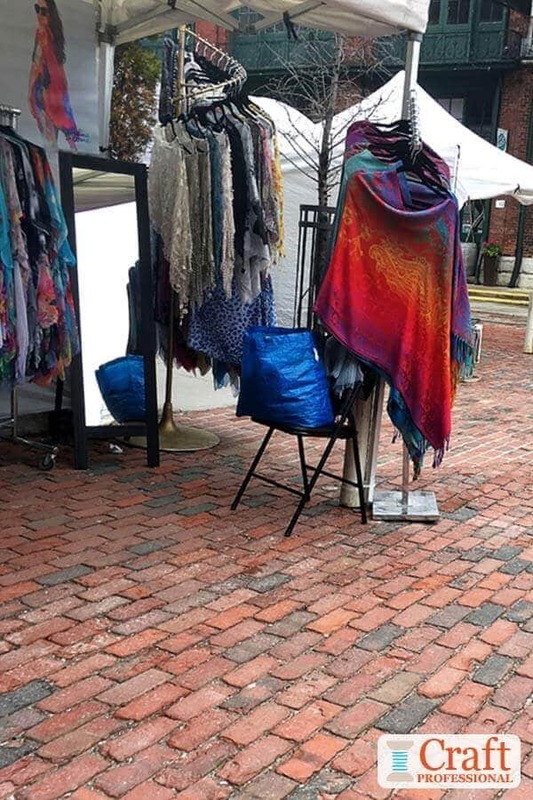 Tents are set up along pretty cobblestone streets. 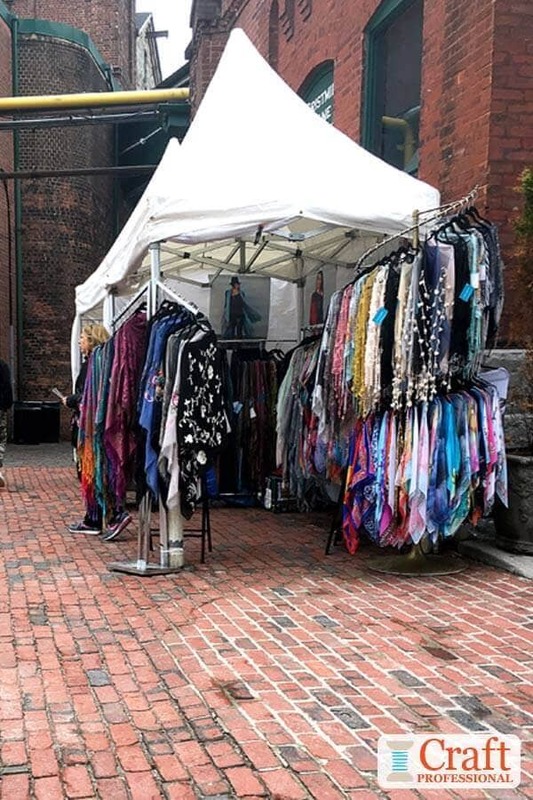 There's no power available to vendors here, so you'll notice that none of these booths use any lighting (although lighting can still make a real impact at outdoor shows, it's less of a problem at outdoor shows compared with indoor shows). 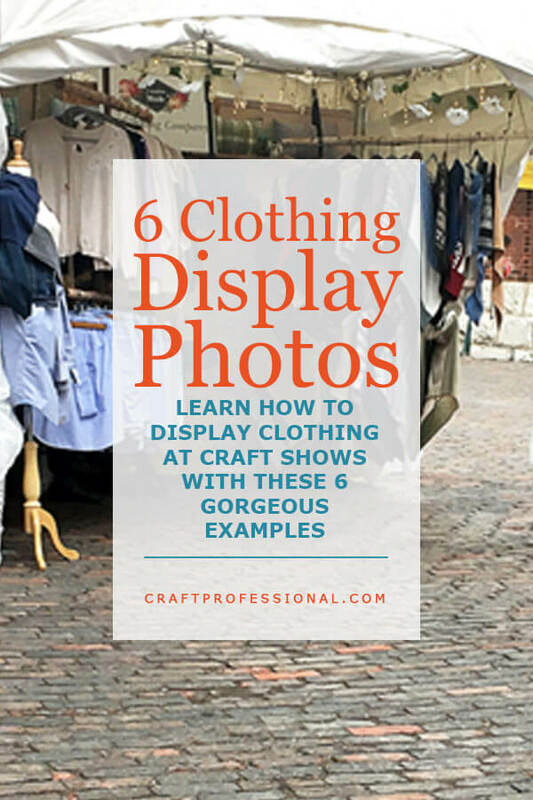 If you look closely at each display, you'll notice that the foundation of each display - portable clothing racks, mannequins, and sometimes grid walls - are pretty common across all of the displays. 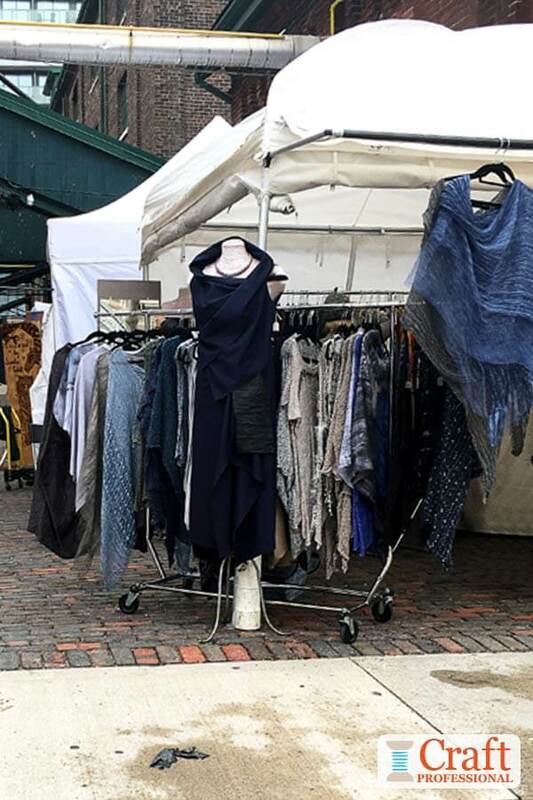 However, each booth has its own distinct personality, and that comes from the clothing designs, and particularly the stand-out pieces each designer chooses to feature. First up, we have a booth that makes good use of waterfall display racks and a similar spiral clothing rack. These racks typically hold fewer items than other clothing rack styles, but they look great and do an excellent job of showing off your products. Notice one rack is pulled out to an outer corner of the booth. This is a strategy to draw attention and bring people into the booth. 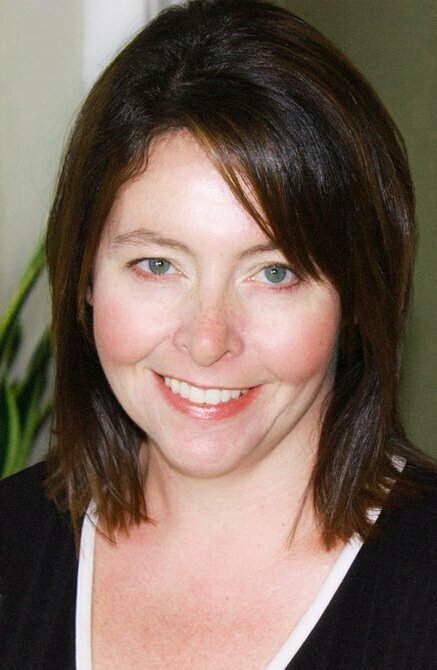 You'll find this strategy used in plenty of display types, not just clothing displays. Be sure to place some of your most eye-catching items out at the front of your booth. Also interesting in the booth is it appears that the 10 by 10 tent is not fully opened. If you look closely, you can see the same is true for the tent beside the one featured in the photo. I assume these two booth spaces aren't a full 10 feet deep, and this is the solution they've used to remain covered (it was quite a rainy day) while staying within the booth space. I've never used a tent in this way, so I can't comment at all on how safe and secure this setup is, but it's interesting. If anyone has used their tent in this way and has some feedback, I'd love to hear about it in the comments at the bottom of this page. Here's another display that makes good use of the outer corner of the space to draw people's attention. This time, a mannequin is used to highlight a striking dress. If you look closely at the bottom of the mannequin, you'll see a tent weight keeping the canopy in place. It's white, so it blends in, and it's behind the mannequin, so it's out of the way and not a trip hazard. A couple of wraps simply hung on hangers from one of the cross bars of the tent add are an extremely simple but effective way to add a little more interest and movement to the display. On a purely practical note, the wheeled clothing rack will be immensely easy to move when it's time to pack up at the end of a show. Here we have more waterfall and spiral racks, which do a nice job of showing off products. The vivid, multi-colored wrap in the front corner of the booth does a great job of catching attention. As a customer passing by, that color will grab your eye. Maybe such a vivid color isn't for you, but that color will catch your eye and bring you into the booth to explore more items for sale. This photo doesn't capture it well, but there's also a large poster in the back of this booth showing this designer's style. The mirror is a must-have in a clothing booth, encouraging customers to try on and check the effect of the look. Here's a clothing display that takes a much different approach than the others. 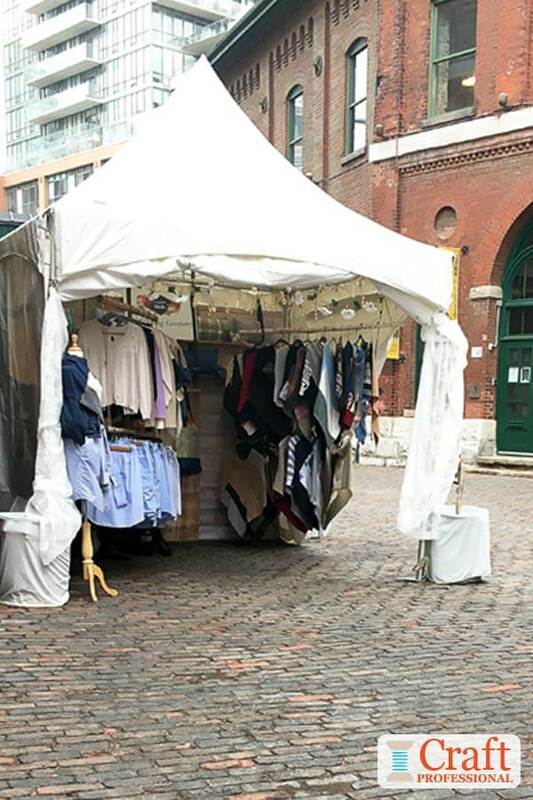 We still see the mannequin at the outer corner, but this time, the designer has hung her clothing from poles suspended from the tent frame. This would be a very inexpensive and portable clothing display option. You would have to be very careful about the amount of weight you suspended from the tent frame. This booth features pretty fairy string lights woven throughout the top of the display. They don't particularly stand out in the photo, but, in person, they were quite lovely. You can buy affordable battery powered string lights, which free you up to use them in shows like this where you don't have access to power. Also notice the round, white containers at each corner of the tent. These, I assume, are DIY tent weights. Under the white covers, you'd probably find buckets filled with water, sand, or cement and secured to the tent frame. Here's another booth that has its own distinctive look, but its foundation is made from the same elements as many of the other clothing displays we've looked at so far. A mannequin at the front corner of the booth draws attention. Waterfall style hooks on a grid wall system show off clothing, and a wheeled clothing rack will make booth set up and tear down easier. This time there's a triangle-shaped grid wall arrangement used to display items toward the front of the booth. This clothing display was at a different show, but it has a similar look, so I thought I'd share it with the other photos. 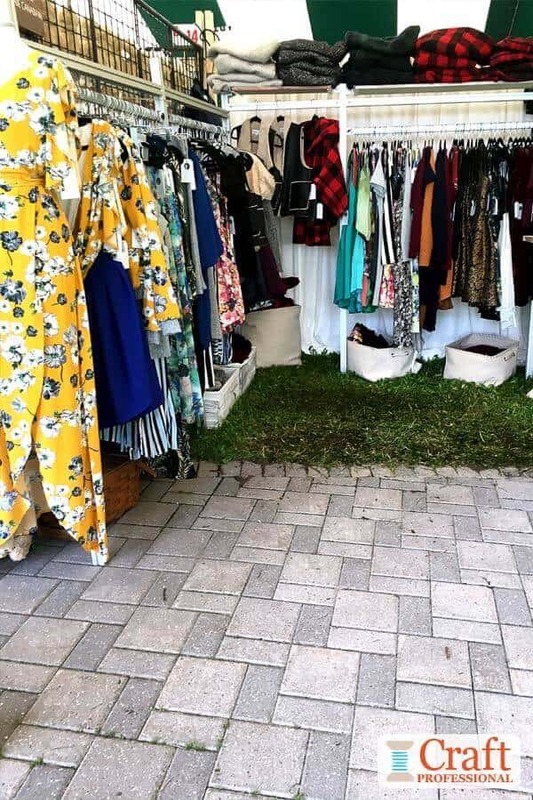 Clothing racks along the back and sides of the booth allow for plenty of display space, and plenty of space for customers to browse the booth. Notice the vivid yellow dress featured at the front of the booth drawing attention and encouraging customers to come in and take a closer look.